Most people were so focused on the visual changes brought along by the sixth-gen Mustang, that the stuff going on under the bodywork and behind the alleged ‘sad’ face were left forgotten about. 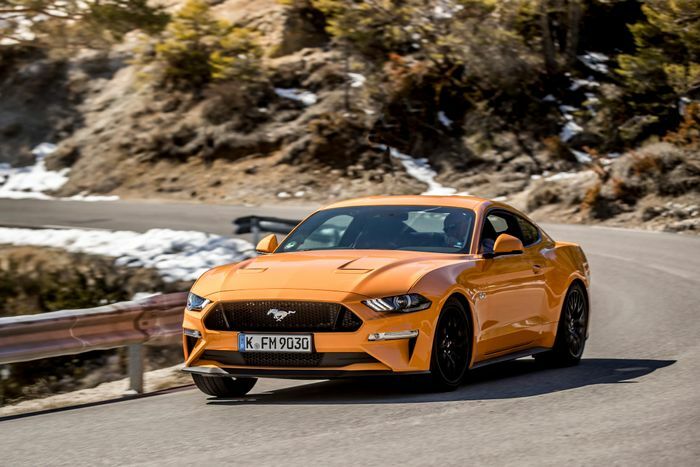 Well, allow us to nudge them back to the forefront of your mind, because Ford’s mid-life Mustang refresh has resulted in a very different car indeed. One of my biggest gripes of the outgoing ‘Stang is the damping: it was woeful. Somehow wallowy and crashy at the same time, it had all the sophistication and grace of The Hulk attempting figure skating. Now though, there’s the option of MagneRide adaptive dampers. These are filled with a “unique fluid,” Ford says, which can be “electronically stimulated” to alter damping resistance. How they behave depends on the driving mode you’re in, but the system also has sensors that monitor a thousand times a second while you drive so the dampers can be constantly tweaked for the best performance possible. Sounds awfully clever when enthusiastically plastered all over a press release, but in the real world, they do work: the 2018 ‘Stang is far more composed when your helmsmith demands are increased, yet whatever mode you’re in, the car now actually rides properly. We weren’t able to try passive dampers out on the launch in the South of France, but they’ve been recalibrated, so should hopefully be much better. 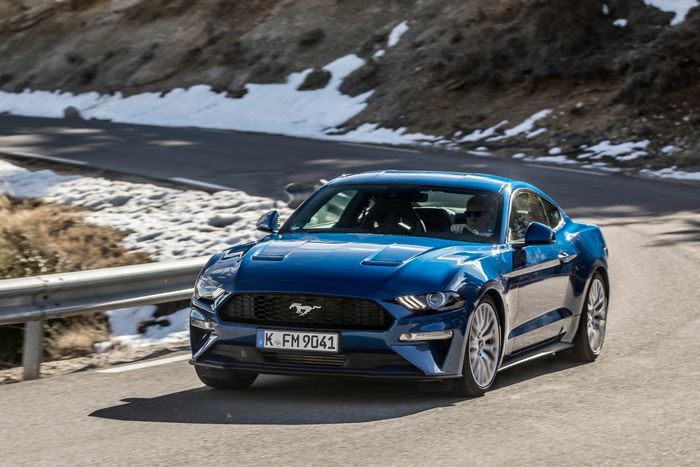 We’ll find out in due course, and keep our fingers crossed, as if a Mustang needs the posher dampers to ride properly, that’s something you’ll need to stump up £1600 for. The optional MagneRide system and the retuned standard dampers aren’t the only alterations on the suspension menu. We have stiffened rear suspension with a new cross-axis joint, plus thicker anti-roll bars front and rear. Chuck all that together with the posher dampers, and you have a car that’s noticeably happier on a twisty bit of road. Yes, the V8-powered GT version still feels leaden and cumbersome at times (in tighter corners you’d swear it weighs over two tonnes, not 1743kg), but it’s now a much more satisfying car to drive. It’s a little more composed, a little better at fast direction changes, and even the steering is less wooly than before. Just avoid the ‘Sport’ steering mode - all that seems to do is add a load of horribly artificial weight and leave you with a weirdly large dead spot around the centre point. 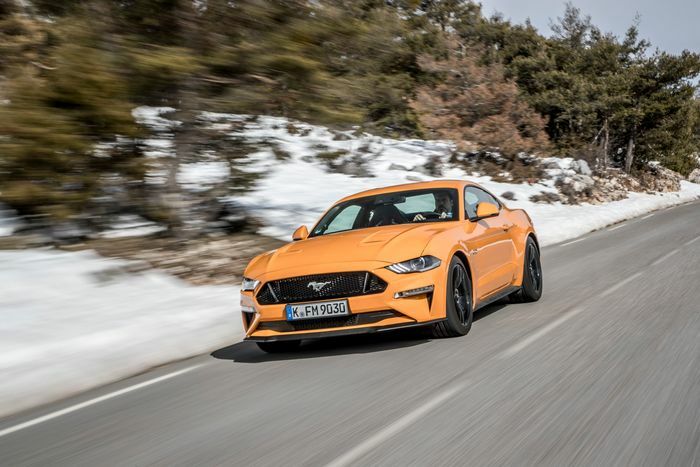 The Mustang GT’s 5.0-litre V8 has received a handful of tweaks, including a new and rather clever high and low pressure dual fuel injection system. As a result, it’s now more powerful, offering up a handy 446bhp. We’ll have to make do with a little less in the UK since we get a different manifold to make space for the steering column that’s on the left for pretty much everyone else in the world, but don’t expect the 4.6 second 0-62mph time of the six-speed manual to drop much. But I really couldn’t care less that it’s a slightly more powerful and a smidge faster than before: when it comes to the engine, all I’m concerned about is the new pipework. It’s a new adaptive system, and I’ve been dearly hoping it’s sorted out the soundtrack of that Coyote V8, which I always found underwhelming. Has it done the trick? Well, just play the video above and you’ll see. Now the car rumbles beautifully at low revs, transforming to a gnarly, dirty bark as the 5.0-litre eight-banger nears its 7000rpm peak power mark. In other words, it’s much more like it - naturally-aspirated V8s are becoming scarce. 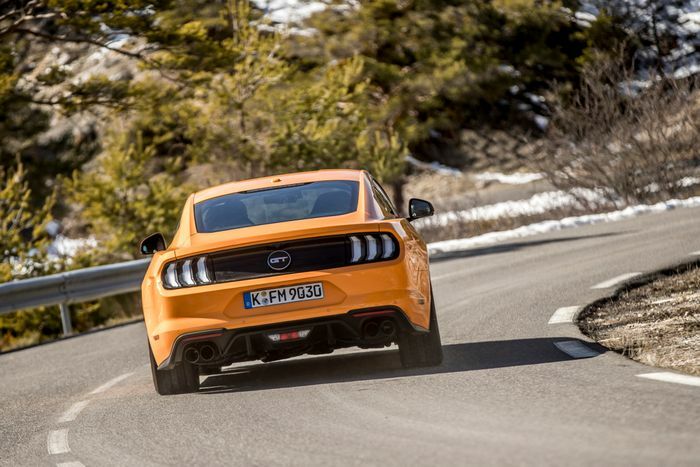 It’s not just suspension tweaks and complicated rubber that have improved the way the Mustang drives: rubber is also a huge factor. All Euro-spec GTs get standard-fit Michelin PS4 S tyres, which is unheard of at this price point, because they’re particularly expensive. And very good - there was nothing strictly wrong with the P Zero Rossos on the old car, but the PS4 S is, we reckon, largely responsible for the added bite to the front end, and the sweeter steering. Grip has increased dramatically too. Usually when physical dials are ditched for fake ones on an LCD screen, I get upset. And moan about it in a bitchy blog. Not so here: yes, the retro-styled dials in the pre-facelift car are awesome, but the Ford GT-inspired, 12-inch LCD replacement is one of the best virtual instrument clusters I’ve ever used. How it looks depends largely upon the drive mode you’re in: leave it in ‘Normal’ and you have a rather ordinary-looking pair of dials, but switch to Sport, and the last few thousand RPMs on the rev counter stretch across much of the screen. Flick it in track, and you get a portrait-style RPM display that spans the top of the screen. It looks awesome to see the engine speed build and slowly fill up the gigantisized rev counter as you push 7000rpm. And what’s more, you can even change the colour scheme if you want. Once more facelifted Mustangs start populating the roads, I reckon we’ll forget all about the mixed reception of the visual tweaks. It works much better in the metal than it did in those initial press shots, and in a lot of ways I do prefer it to the old one. Particularly around the lower half of the front bumper: I’m a fan of those new diagonal ‘slots’, and the rearranged lighting is a good look. It somehow looks more grown up and more expensive, especially in the new Fury Orange hue - if you buy one of these and don’t option it, we’ll be tremendously disappointed in you. The pre-update version was already the superior driving car, and unsurprisingly so: it was about 80kg lighter, with much of the savings coming from the considerably less porky 2.3-litre engine. The inline-four turbo’s central mass is much further in the engine bay too. With this more handling-friendly setup, all those suspension changes we talked about earlier make an even more dramatic difference to the Ecoboost. It’s still not quite a sports car, but damn, it’s really not far off now. There’s an added keenness to the way it turns in, and a tidier attitude mid-corner thanks to the posh new dampers. Find the right road and give it a damn good spanking, and you’ll have more fun in this. But everywhere else, the V8 is more memorable and - in these depressing days of downsizing - more exotic. The Mustang is more compelling than ever. It’s still not perfect of course - the interior feels cheap in places, the manual gearbox is quite an industrial thing to use, and the new 10-speed automatic is just good rather than great. And that’s before you put it in Sport mode and jerkily pull away, as though the ‘box is having a fight with the engine. Ford is also making you pay for the improvements: the six-speed manual GT now weighs in at £41,095 (the cheapest Ecoboost is £35,995). Suddenly, it feels like a long time ago that it introduced it in the UK at a much more palatable - and absurdly cheap - £32,995. Granted, it crept up to around £38,000 towards the end of its life, but that’s still a £3000 jump. But, the refreshed car is at least £3000 better, and then some. There’s still nothing like it for the money on our shores, and now that it drives more nicely, possesses a better set of lungs and has cool new tech, it’s easier to recommend than ever.